looking towards the front, not back. And maybe put a display in front too. Yeah and you smell bad! Seriously, looks like lovely work. Perhaps a top-down view of a chair would be more clear, though. Is this going to be in gnome 2.30? Will this be in Ubuntu 10.04? Why not have a round-robin test, like many surround amplifiers have? It plays an ocean sound out of the front left, then switches to centre after a couple of seconds, then to front-right, etc. 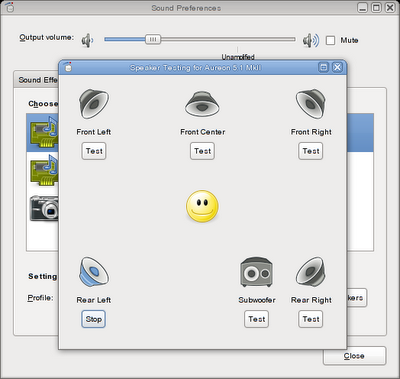 So you can check all your speakers with just one click. The back of a smiley face would look.. pretty barren. Instead just flip the placement of the speaker icons. > The back of a smiley face would look.. pretty barren. Instead just flip the placement of the speaker icons. Yeah, you're right on that. Time to ditch the smiley then. I think another problem with the smiley is, it has no ears.